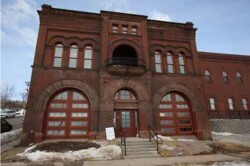 A decommissioned firehouse originally built in 1889 reopened earlier this year as part of the Firehouse and Firehouse Flats affordable housing development in Duluth, Minn. Duluth’s historic Fire House No. 1 and an adjacent former stable connect by skyway to a newly constructed, three-story building with underground parking. Developed by Minneapolis-based MetroPlains LLC, the $9.3 million property offers 40 multifamily units in Duluth’s Hillside neighborhood. Rob McCready, MetroPlains co-president, said that Firehouse and Firehouse Flats offer quality housing to families who need a more affordable alternative to market-rate rents. “If someone comes here trying to make ends meet and they’re suddenly able to enjoy the quality of life the property offers, that’s a miracle,” said McCready. Plans to develop Firehouse and Firehouse Flats emerged as a community response to the need for more quality, affordable housing in the city. “There’s a clear demand and shortage of affordable housing in Duluth. The Hillside neighborhood has some of the city’s oldest housing stock,” said Pam Kramer, executive director of the Duluth office of the Local Initiatives Support Corporation (Duluth LISC). existing housing, demolishing blighted properties and creating more affordable, mixed-income and mixed-use developments. This is a part of LISC’s Building Sustainable Communities initiative, known locally as At Home in Duluth, a partnership of 25 organizations working to help Duluth residents and neighborhoods prosper. in partnership with United Healthcare. the neighborhood’s 11.2 percent unemployment rate is more than double that of Duluth’s overall unemployment rate of 5.2 percent. the street with active living and community space that show a vibrancy to the streetscape,” he said. units have views of Lake Superior. Amenities include a courtyard, rooftop deck, community room, underground parking, storage and a fitness center. Nine units are set aside for households earning 30 percent of the area median income (AMI) and 27 units are set aside for households earning 60 percent of the AMI, but rents are restricted to 50 percent AMI rental rates. The remaining four units are set aside for formerly homeless residents. A local social services group, Churches United In Ministry, provides case management services such as helping tenants maintain housing and find sources of income to pay rent. The key to gaining community acceptance of an affordable housing development is to get neighbors involved with plans from the beginning, said Young. “This project was started by the neighborhood, so there was never even a chance of NIMBYism. Because people have been involved with the process from the beginning, they realize that the developments are a benefit for everyone,” she said. Firehouse and Firehouse Flats were so well received in the community that people who earned above the maximum allowable income tried applying for units, said Rick Ball, executive director of HRA Duluth. “When people at higher incomes wish they could live there, that’s a real good sign,” said Ball. Young said part of the development’s charm was the great care that went into preserving historic details of the old fire house, which has been on the National Register of Historic Places since 1975. “They kept something that tells the story of what the building was. Timbers are exposed, and the original details of the firehouse are still present,” said Young. Ball added that large doors originally built for the horse-drawn fire truck were converted into windows that maintained the historic Palladian arches. LaVerne Hanson Jr., MetroPlains co-president and an architect, was responsible for the nomination and project design. FY 2015 and that program advocates are lobbying for its reauthorization. “Highlighting examples like the Firehouse Apartments illustrates how important and successful the program is – that’s how we show it’s working,” said Kramer. Rehabilitating historic public buildings into private homes is nothing new in Duluth. Several historic public buildings are now affordable housing in the city, including Irving School and Endion School – both elementary schools built in the 1890s. Kramer noted that with Duluth’s rich historic architecture, there are many other buildings that could be adaptively reused through the use of HTCs combined with other public and private resources. Ball said that financing is the largest barrier to developing in Duluth and that a mix of funding sources is essential to success. “We talked about layers of financing – ‘lasagna’ financing – and saw that that was what this project needed,” he said. Minnesota Housing Finance Agency contributed $745,000 in annual LIHTCs during the first allocation round of 2010. The development also benefitted from $540,000 in federal HTC financing and $540,000 in state HTC financing. The combination of these three credits yielded an equity investment of $7.63 million by United Healthcare in partnership with U.S. Bank. The Greater Minnesota Housing Fund provided $220,000 and Minnesota Housing provided $1.4 million, both in the form of 30-year deferred loans.